Ludwig Wilhelm Erhard (German: [ˈluːtvɪç ˈe:ʁhaʁt]; 4 February 1897 – 5 May 1977) was a German politician affiliated with the CDU and the second Chancellor of the Federal Republic of Germany (West Germany) from 1963 until 1966. He is often famed for leading German postwar economic reforms and economic recovery ("Wirtschaftswunder," German for "economic miracle") in his role as Minister of Economics under Chancellor Konrad Adenauer from 1949 to 1963. During that period he promoted the concept of the social market economy (soziale Marktwirtschaft), on which Germany's economic policy in the 21st century continues to be based. In his tenure as chancellor, however, Erhard failed to win confidence in his handling of a budget deficit and his direction of foreign policy, and his popularity waned. 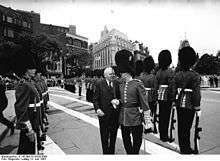 He resigned his chancellorship on 1 December 1966. During his time in Frankfurt he married Luise Lotter (1893–1975), widow Schuster, on 11 December 1923. After his graduation they moved to Fürth and he became executive in his parents' company in 1925. After three years he became assistant at the Institut für Wirtschaftsbeobachtung der deutschen Fertigware, a marketing research institute. Later, he became deputy director of the institute. During World War II, he worked on concepts for a postwar peace; however, officially such studies were forbidden by the Nazis, who had declared total war. As a result, Erhard lost his job in 1942 but continued to work on the subject by order of the "Reichsgruppe Industrie." In 1944 he wrote War Finances and Debt Consolidation (orig: Kriegsfinanzierung und Schuldenkonsolidierung). In this study he assumed that Germany had already lost the war. 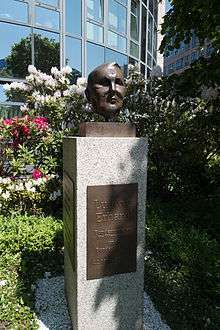 He sent his thoughts to Carl Friedrich Goerdeler, a central figure in the German resistance against the Nazi government, who recommended Erhard to his comrades. Erhard also discussed his concept with Otto Ohlendorf, deputy secretary of state in the Reichsministerium für Wirtschaft. Ohlendorf himself spoke out for "active and courageous entrepreneurship (aktives und wagemutiges Unternehmertum)", which was intended to replace bureaucratic state planning of the economy after the war. Erhard was an outsider who supported the resistance, who personally and professionally rejected Nazism, and who endorsed efforts to effect a sensitive, intelligent approach to economic revival during the approaching postwar period. In April 1948 Erhard was elected director of economics by the Bizonal Economic Council. On 20 June 1948, the Deutsche Mark was introduced. Erhard abolished the price-fixing and production controls that had been enacted by the military administration. This exceeded his authority, but he succeeded with this step. In the first free elections following the Nazi era, Erhard stood for election in a Baden-Württemberg district and was elected. He was appointed Minister for Economics, a position he would hold for the next 14 years; from 1957 to 1963 he was also the 2nd Vice-Chancellor of Germany. In domestic policy, a number of progressive reforms were carried out during Erhard's time as chancellor. In education, the number of years of compulsory education was extended, spending on schools was significantly increased, and a standardisation of the school system among the Lander (Hamburg Agreement) was carried out. In the field of social security, Housing Benefit was introduced in 1965, while federally funded child allowances for two or more children were introduced a year earlier. Erhard explored using money to make possible reunification of Germany. Despite Washington's reluctance, Erhard envisaged offering Nikita Khrushchev, the leader in Moscow, massive economic aid in exchange for more political liberty in East Germany and eventually for reunification. 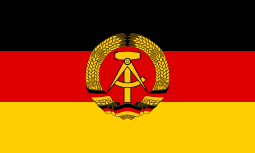 Erhard believed that if West Germany were to offer a "loan" worth $25 billion US to the Soviet Union (which Erhard did not expect to be repaid), then the Soviet Union would permit German reunification. The acting American Secretary of State George Wildman Ball described Erhard's plan to essentially buy East Germany from the Soviet Union as "half-baked and unrealistic." Erhard's objective corresponded in time with Khrushchev rethinking his relations to West Germany. The Soviet leader secretly encouraged Erhard to present a realistic proposal for a 'modus vivendi' and officially accepted the chancellor's invitation to visit Bonn. 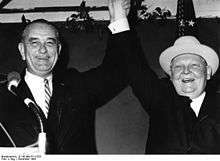 However, Khrushchev fell from power in October 1964, and nothing developed. Perhaps more importantly, by late 1964, the Soviet Union had received a vast series of loans from the international money markets, and no longer felt the need for Erhard's money. 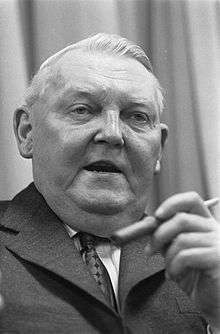 Erhard continued his political work by remaining a member of the West German parliament until his death in Bonn on 5 May 1977. He was buried in Gmund, near the Tegernsee. The Ludwig Erhard-Berufsschule (professional college) in Paderborn, Fürth and Münster are named in his honour. Erhard's first ministry was from 16 October 1963 – 26 October 1965. Erhard's Second Ministry occurred from 26 October 1965 – 1 December 1966. 28 October 1966 - Hans-Christoph Seebohm (CDU) succeeds Mende as Vice Chancellor, remaining also Minister of Transport. Johann Baptist Gradl (CDU) succeeds Mende as Minister of All-German Affairs. The other FDP ministers, Dahlgrün and Scheel, also resign. 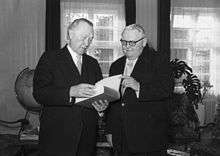 8 November 1966 - Kurt Schmücker succeeds Dahlgrün as Minister of Finance. Werner Dollinger (CSU) succeeds Scheel as Minister of Economic Cooperation, remaining also Minister of Federal Treasure. ↑ "The Social Market Economy." Federal Ministry for Economic Affairs and Energy, Federal Republic of Germany. Retrieved 2015-09-11. ↑ Alfred C. Mierzejewski (2004). Ludwig Erhard: A Biography. U of North Carolina Press. pp. 18–26. ↑ Mierzejewski, Alfred C. (2004), "1957: Ludwig Erhard's Annus Terribilis", Essays in Economic and Business History, 22: 17–27, ISSN 0896-226X . ↑ Van Hook, James C. (2004), Rebuilding Germany: The Creation of the Social Market Economy, 1945–1957, New York: Cambridge University Press, ISBN 0-521-83362-0 . ↑ Jan Friedmann and Axel Frohn (October 4, 2011). "A 'Half-Baked' Deal Former German Chancellor Considered Buying East Germany". Spiegel. Retrieved 2011-10-05. ↑ Schoenborn, Benedikt (2008), "Bargaining with the Bear: Chancellor Erhard's Bid to Buy German Reunification, 1963–64", Cold War History, 8 (1): 23–53, doi:10.1080/14682740701791318 . ↑ Matthew D. Tippens, "When Bratwurst Met BBQ: West German Chancellors in LBJ's Hill Country," West Texas Historical Association, annual meeting in Fort Worth, Texas, February 26, 2010; the paper was actually presented by Rob Weiner of Texas Tech University in Tippens' absence. ↑ Blang, Eugenie M. (2004), "A Reappraisal of Germany's Vietnam Policy, 1963–1966: Ludwig Erhard's Response to America's War in Vietnam", German Studies Review, 27 (2): 341–360, doi:10.2307/1433086, JSTOR 1433086 .